Heiko Heinze – Protecting The Environment is an opportunity! Protecting The Environment is an opportunity! Here you can watch a spontaneous application video made by German student Antonia Legler for the 4th meeting in Lithuania. She had already taken part in the 3rd TTALA in Finland. Inspired by her participation in this meeting she sent a spontaneous application to the Coordinator of the German school, Mr Heiko Heinze. Antonia was one of the students in our project who realized the great opportunities that the Erasmus+ Project offers to students. She spread her experiences at Pestalozzischool in Radeberg as well as in dissemination events of the Saxon State Ministry of Culture on 23rd September 2017 in Dresden. The final project evaluation was carried out at all schools on Google Docs using modern ICT. The result was overwhelming! 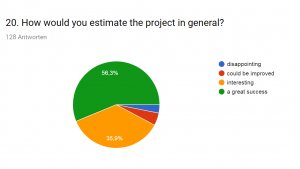 92,2% answered the question “How would you estimate the project in general?” with “a great success” or “interesting”. 81,7% of our students and teachers stated that the project has helped them to improve their linguistic competences in the English language. 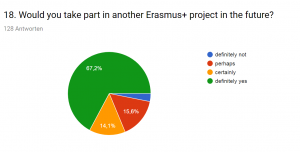 81,3% would like to take part in another Erasmus+ project. This video was created made by German student Eric Hensel who took part in the 3rd TTALA in Veikkola, Finland. This photo book was created by the German student Janine Kloske who took part in the 1st TTALA in Bescanó, Spain. During the project all partners researched major environmental problems in the participating countries. The results were put into presentations that were shown at the 2nd TTALA in Germany. Afterwards the German students assembled the gathered information into an interactive map of Europe with major environmental problems in the participating countries. 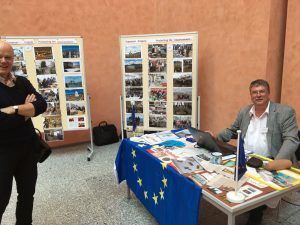 The project coordinator Mr Heiko Heinze held together with the Saxon State Ministry of Culture and the Pedagogical Exchange Service of the Standing Conference and the SBI an information event on the EU educational programs Erasmus + and eTwinning on 23 August 2017. The aim of the event for headmasters of all types of schools was to familiarize them with the EU programs, to get them involved in relevant projects and to show them support options for their implementation. 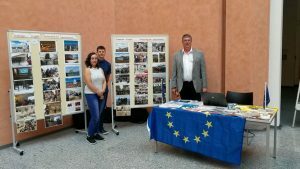 More than 70 participants received comprehensive information on European funding opportunities and the conditions for applying in Key Actions 1 and 2 of the EU Education Program. 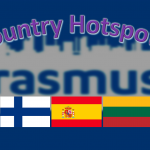 In a market of Erasmus + and eTwinning initiatives, as well as in various workshops, they experienced examples of European school partnerships, which through shared learning activities make intercultural exchange tangible. By clicking on the link you can watch a video about this event in Dresden. 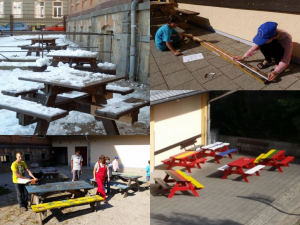 Before the 2nd TTALA in Radeberg, Germany all benches in the school yard were painted in the colours of the partner countries. Every school created a presentation for introducing their schools, the regions and the countries at each TTALA. They were performed to a huge audience up to 400 students and more. After the end of this project these presentations will be useful in various school lessons such as Geography, foreign languages, Biology, Ethics etc. Watch an example of a PowerPoint presentation made by German students. 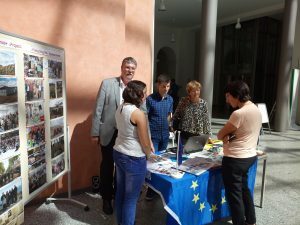 Here you can watch a video about all activities carried out at the 2nd Transnational Teaching and Learning Activity in Radeberg, Germany in September 2016. This project has been funded with support from the European Commission. Responsibility for the information and views expressed here lies entirely with the authors.